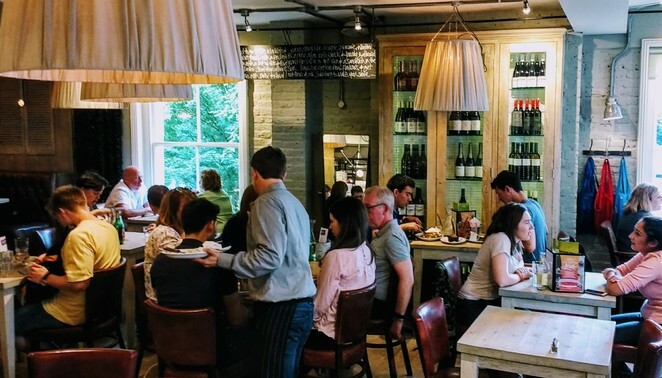 As the weather turns cooler and we abandon the picnic blankets and revisiting local restaurants takes prime position on the weekend 'to do' list of many Londoners once again. But where do you go if you want to steer away from all the traditional 'pub' menus that despite small variances, seem same after same, without committing to an entire cuisine for the table with Indian, French or Thai? Enter, Bills. A higher-end chain restaurant whose fare would not be out of place in locations like Australia or Los Angeles; offering multiple 'lighter' options alongside their heavier companions. I can't tell you how refreshing it was to see a menu where the salads had more to offer than being a simple 'chicken salad', and where making a lighter choice, didn't involve even having to have the salad at all! Relief, I'm sure that is also shared by those with dietary intolerance or lifestyle choices alike. Grilled Halloumi salad with chargrilled red peppers, asparagus, red onion, courgettes, smoky tomatoes, parsley, mint and pesto flatbread (Â£11.95) is far from boring! 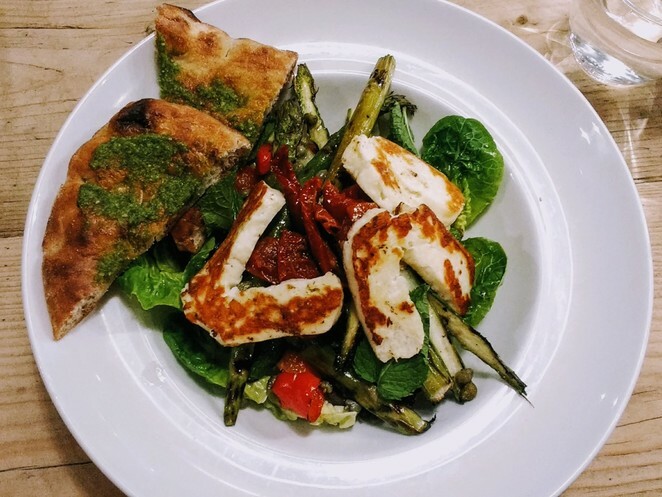 Likewise the Feta & butternut squash quiche with smoky tomatoes, parsley, olives and a mixed salad (Â£9.95), or Herb Crusted Cod with warm lentil, kale and fennel salad (Â£13.95). Those three items alone on the menu were enough to convince me to visit for lunch and I wasn't disappointed. 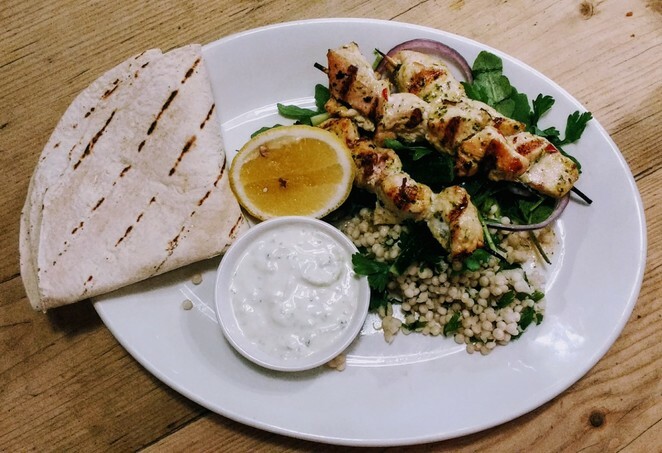 Neither were my dining companions who were both drawn to the Mojo Marinated Chicken Skewers served with toasted fregola, mint, coriander, parsley, Tzatziki, cucumber and red onion salad & flatbread (Â£11.25). Don't worry if you fancy some traditional British fare; the menu also features the old favorite Fish Finger Sandwich served with rocket, fries and tartar sauce (Â£9.95), a burger menu five offerings deep and flat iron steaks (Â£15.95 served with caramelised red onions, smoked tomato, rocket salad and fries) among others. We visited the Richmond branch of Bills for a Saturday lunch, and if all branches are as popular as this one then it pays to book in advance; every table was full. The staff were friendly and professional. Perhaps some room to improve as we were forgotten by our waiter, who apologetically returned 35 minutes after seating us to collect our order. Fortunately, we had had the foresight to wave down another passing waiter so crisis had been averted, although our meal was very delayed and we did pick up that there was confusion resulting from however/whomever had sent it to the kitchen. But nothing that would discourage a future visit, and in fact, I've already been trying to book one in. Why? Healthy yet hearty British food done well!